IAF is aggressively upgrading infrastructure on its eastern theatre to boost strategic deployment of advanced assets. 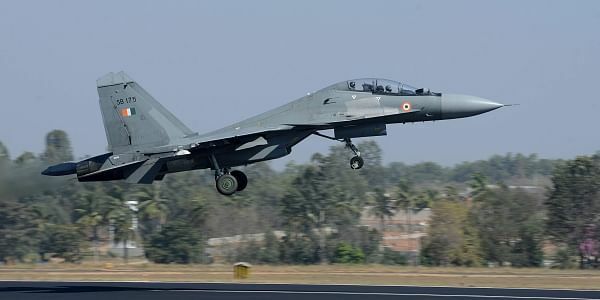 SHILLONG: The Indian Air Force (IAF) is aggressively upgrading infrastructure on its eastern theatre to boost strategic deployment of advanced assets close to the Chinese border. "The infrastructure development is taking place at a very, very rapid pace in the eastern front. We are inducting a number of new platforms in term of weapons, radar systems, networking systems," Air Marshal Anil Khosla, who heads the Shillong-based Eastern Air Command, told IANS. "We are getting Rafale aircraft, Chinook heavy-lift helicopters and Apache attack helicopters. Recently, we have inaugurated a new C-130 J squadron complex in the Eastern Air Command," he said on the sidelines of the Air Fest at the Shillong Advanced Landing Ground here. Noting that Eastern Air Command is growing from strength to strength, Khosla said, "We are getting ready to absorb the new technology and in another few years, may be two-three years or five years, it will be a very, very potent force (Eastern Air Command)." "As I said, the delivery has already started. The radars are already coming in. We already have C-130 and we have operationalised a lot of helicopters units such as Mi-17 and Mi-17 V5, ALH, and in future we will get Chinooks, Apache, Rafale. So for all this, infrastructure is required," he said. He said that six advance landing grounds have been made operational in Arunachal Pradesh, and added that the advance landing ground at Tawang is being upgraded as well as another at Vijaynagar. "A lot of infrastructure is coming in our airfields to house the new (radar and networking) systems. We are trying to improve the operating surfaces further so that all these fighters and heavy transport aircraft can land and take off," the Air Marshal said. "We are trying to make bases for housing our new radars which will be coming in. In addition, we are trying to upgrade our ranges to 'air to ground' ranges which are very important for the training of people," he said. "It is a capability building of our own as over the years we have improved in the country economically. It is all-round capability building and development in the civil field as well as in the military field. So it is not aimed at any particular country. We are building up our capability and Air Force is becoming a potent and formidable force, and it is towards that," he added.